The International Golf Travel Market (IGTM) is the annual golf trade show for the golf tourism industry. IAGTO is the official association partner of IGTM. Over 95% of the IGTM participants attend this event where IAGTO holds a social evening on the Tuesday evening and the annual IAGTO awards on the Thursday evening. Tour operators (buyers) receive free registration and 4 nights accommodation free of charge. All members enjoy exclusive and free participation in the IGTM Golf Tournament. 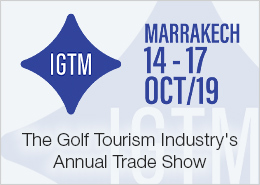 International Golf Travel Market (IGTM), organized by Reed Travel Exhibitions, has announced that the city of Marrakech, Morocco will host the 22nd edition of the world’s premier global event for golf tourism suppliers, buyers and media, from 14-17 October, 2019.